It's a book! 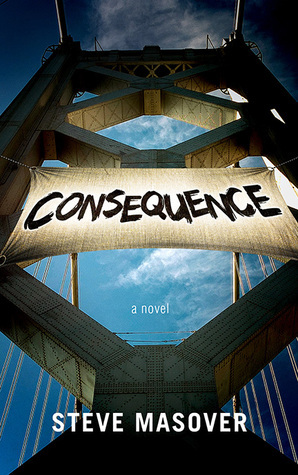 CONSEQUENCE coming in October - Goodreads Giveaway starts today. Have I mentioned I've been writing a novel? Ten weeks and counting 'til the official release date (29 September), I'm elated to announce that the finish line is visible at the end of the tunnel: my debut novel Consequence will be in readers' hands, Kindles, Nooks, iDevices, phones, and tablets by early October, in paperback and e-book editions. "I couldn’t put Consequence down! Masover ... asks thorny, essential questions about personal responsibility and the role of violence in movements for social change." 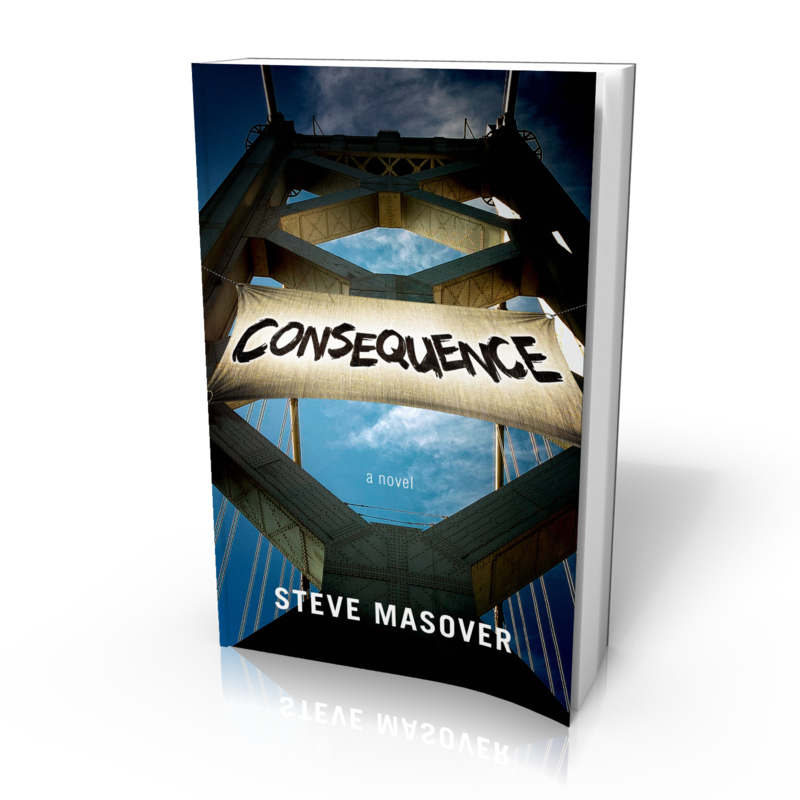 "Consequence is a great read, full of building tension and excitement ... Masover writes about conflicts central to the human situation." Over the coming weeks I'll occasionally post book news here, but a more complete announcement stream will be posted to my Author Page on Facebook, which I invite you to "Like" if you want to keep an eye on notifications about the book's launch party, readings, interviews, book fair appearances, panels, and so forth. 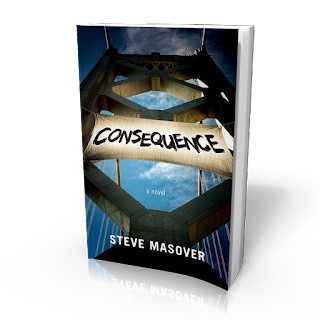 If you have an itch to read Consequence early, there's a giveaway for that. Beginning today you can sign-up for a chance to win an advance-reader copy (ARC) on Goodreads. All you have to do to enter is be (or become) a Goodreads reader -- it's free -- and click the Enter Giveaway link above (or on Goodreads' Consequence page) before the giveaway ends. Whenever you read Consequence, I hope that you'll leave reviews on both Amazon and Goodreads to let other readers know what you think. On Saturday -- on my way to a march protesting the transport of Bakken oil via "bomb train" through Richmond, California and other cities and towns -- and within lethal range of homes, schools, churches, shops, and workplaces -- a coal train was slowly rolling south (toward the Port of Oakland) as I stepped off the BART train. Its engine was too far ahead to see from the platform. After hauling my bike down the stairs, through the station, up some more stairs, and peddling to the corner of W. MacDonald and 16th, where I met and chatted with a friend, then finally headed west toward the march's starting point ... yep, that the train was still chugging past. 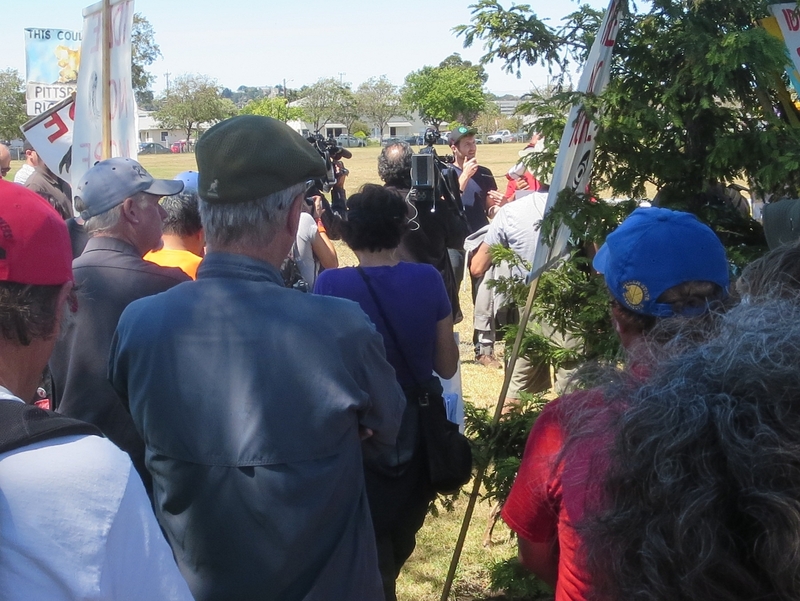 On the other hand, the march that kicked off at Atchison Village, stopped at the entrance to Kinder Morgan's Richmond railyard, and wound up with a rally at Washington Park, was spirited and colorful. The photo below shows Forest Ethics organizer Ethan Buckner speaking to the crowd at Atchison Village. Ethan spent the night in jail earlier in the week, arrested by the California Highway Patrol for hanging a banner off a railroad bridge in Benicia, part of a week of action aimed at stopping lethal transport of volatile crude (whose extraction via fracking from the Bakken formation dangerously exacerbates CO2 emissions that are changing Earth's climate, not to mention the earthquakes and fouled aquifers) along routes that endanger anyone and everything within a kilometer of the tracks (see the Canadian National Post timeline of the Lac-Megantic train disaster, in which a bomb-train killed 47 people). So what about that coal train? Well, I can't say for sure but I'm guessing it was headed for the Port of Oakland, where the city (both government and citizens) and real-estate developer Phil Tagami are in a nasty fight over whether the dirty coal is to be shipped through the port. A rally followed by a speakout at the Oakland City Council meeting next Tuesday, 21 July, will demand a coal-free Oakland. The threat to people and planet posed by our deeply-embedded reliance on fossil fuels to power economies around the world isn't going to be neutralized easily. Anyone who has paid the least bit of attention to climate change politics over the last fifty years knows that. Regular people need to engage en mass if we're going to successfully drive a wedge between politicians and the massive energy companies that grease their every lubricious surface. Later this year, the United Nations Conference of Parties will have its 21st annual meeting, in Paris this time around (COP21 is one of the meeting's several appellations). Here in the Bay Area, organizing has begun for a mass action to demand "a global agreement to implement dramatic and rapid reduction in global warming pollution" (from the emergent coalition's Points of Unity statement, to be finalized later this week and published online soon). The coalition keeps tweaking its name, but this week it's the Northern California Climate Mobilization. What's happening in your part of the world?